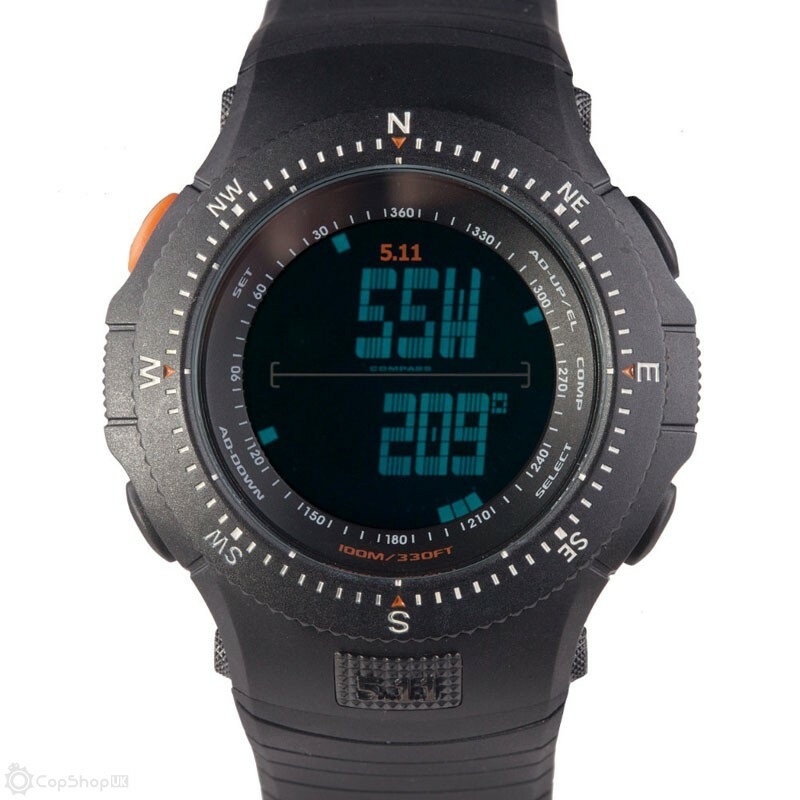 Once again, innovation is the “watch” word for 5.11 Tactical Series. When we set out to design a watch we wanted one that would truly serve the needs of law enforcement and military professionals. The Field Ops watch has all of the features needed for day to day activities and includes our revolutionary SureShot® calculator. In a partnership with Horus Vision, makers of proven long-range ballistic software, we bring sophisticated point of impact software to your wrist. We give you the ability to input thirteen critical variables needed for long range shooting solutions quickly and easily. Our shooting solutions are provided in Mils, True Minute of Angle (TMOA) and Shooter’s Minute of Angle (SMOA). And that’s not all, this rugged watch can take a real beating. We’ve beefed up the Field Ops Watch pins to stand the strain of a wrestling match, sealed the watch for 100 meters of water resistance and given you a switchable backlight so you can see your data when you need it and turn the light off when you dont. This great looking timepiece is perfect for any activity. The Field Ops Watch has all the features you’ll need for work and play. We’ve included digital day and date, and two digital time zones. Along with an audible alarm, there is an hourly chime, a countdown, timer and you can check your lap times with a digital chronograph. We’ve included an omni-directional bezel along with a backlight. The Field Ops Watch also has a fully functional digital compass which can be adjusted for true north readings. And last but not least, we’ve given you a full function ballistic calculator. The SureShot® calculator accepts thirteen critical shooting variables to give you point of impact shooting solutions out to 1000 meters. Input your known ballistic data (bore height, ballistic coefficient, muzzle velocity and zero range), then add your environmental data (range, temperature, altitude, inclination) and the SureShot® calculator will give you a shooting solution in MILS, TMOA or SMOA. You can even get your solution in clicks for both windage and elevation. The calculator is very easy to use and most of the variables can be put into the Field Ops Watch before going out to the field. This full function time piece is unique in the world of watches. The Field Ops Watch has a high-density polycarbonate case which is lightweight and tough. The mineral glass crystal face is scratch resistant and reduces glare. We’ve beefed up the watch pins to secure the watch to your wrist in even the most arduous activities. We’ve included an extended length band so that you can wear your watch over outerwear or a glove. That way your SureShot® is available anytime you need it.